Theconfirmation of Martian water ice by the Phoenix Mars Lander may hint at theplanet?s potential for supporting life — or at least human life. NASAscientists have quietlydeveloped technologies such as microwave beams for future explorers toextract water from the moon or Mars, even as the Phoenix team focuses onfinding out more about the Martian climate and history of water. "Ifthere is an outpost, there's a need for water, and we don't want to bring waterfrom Earth," said Edwin Ethridge, a materials scientist at NASA's MarshallSpace Flight Center in Huntsville, Ala.
Watercould provide more than just an extraterrestrial drink: the right equipmentcould break down water for oxygen and even fuel for a human mission. That couldlighten the load and cost of any future mission heading for the moon or Mars. Ethridgespends most of his time workingon the Ares rockets slated to return NASA astronauts to the moon. Soperhaps it's no surprise that he devotes his spare moments to tinkering with adevice that can beam microwaves down to help extract underground water ice. "Oneof the chief advantages of microwaves is that it will penetrate the soil, andso would greatly minimize if not eliminate requirement to dig," Ethridgetold SPACE.com. Eliminatingthe need to dig would also reduce the chance for dust tocause problems with astronauts and their equipment. Microwaves could alsowork better on the moon given its near-vacuum environment and super-insulatinglunar dust. Ethridgeworked with colleague Bill Kaukler, also at NASA Marshall and a materials scientist at theUniversity of Alabama in Huntsville, to run demonstration tests on simulatedlunar permafrost. They found that they could remove 98 percent of water icethrough sublimation, or converting the frozen water directly into a gas, andcould also capture 99 percent of the extracted water. Recentmissions have shown that any water found on the moon or Mars will likely remainlocked away in ice, whether on the surface or underground. Adjusting thefrequency of microwaves can allow them to penetrate deeper to reach any suchfrozen reservoirs. Theuse of water-mining technology during the planned moon missions could serve asa "test bed for Mars and any other extraterrestrial body that haswater," Ethridge noted. Noone has uncovered solid evidence of water ice on the moon yet, but lunarorbiters have detected concentrations of hydrogen at the poles that stronglysuggest the presence of untapped ice. A study earlier this year also confirmedthe presenceof water inside ancient moon samples brought back by Apollo astronauts. "Atthe poles, there are craters that have been permanently shadowed for billionsof years," Ethridge said. Many lunar scientists suspect that water icesurvives in those permanently shadowed regions away from sunlight. Noone has to wonder that about Mars, where the Phoenix Mars Lander directlydetected water ice after scraping away at the polar surface. Mars orbitershave also detected concentrations of hydrogen on the red planet, all the wayfrom the poles to near the equator. "Itabsolutely amazed me about Mars that they just had to scratch the surface andfound water ice that is stable," Ethridge said. Therecould be an ocean of frozen water under Phoenix, but tapping it would stillrequire energy resources that a Mars mission might not have. 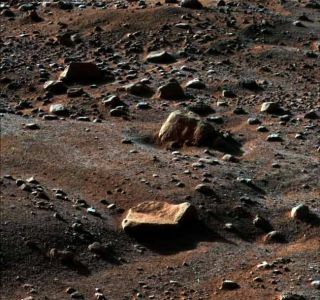 "Asfar as humans go, if you want to form a colony on Mars or establish a station,you'd want to dig a well and pump liquid up from the surface," said PeterSmith, the principal investigator leading the Phoenix Mars Lander mission atthe University of Arizona in Tucson. Liquidwater would much more easily enable any human mission, but remains an elusiveand perhaps unlikely find. Phoenix still needs to run further tests on itswater ice sample. "We'retrying to figure out its past," Smith noted. "Our job is to figureout if this ice has melted and gone through a liquid phase." Meanwhile,Ethridge continues to plow ahead with his study to make the microwaveextraction process more efficient. He and Kaukler hope to shrink the energyrequirements for their current 1 kilowatt system. "Oneof the early landers on the moon probably won't have that power," Ethridgepointed out. "We're working on a smaller power type demonstration." Mostscientists agree that the current Martian climate remains too cold for water toexist in liquid form. Still, some hold out the chance for flowing watersomewhere underground, perhaps in the form of hot springs. "Ithink that's the big discovery yet to be made that's going to enable humans togo to Mars and sink a well," Smith said.